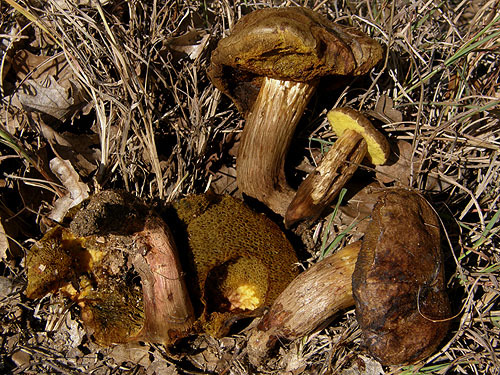 Fruitbodies single or often clustered in groups. Cap up to 7 cm, at first hemispherical, then convex, finally flat-convex, flat or slightly depressed, glabrous or somewhat fibrillose, sometimes finely cracked, clay buff or fawn, later purplish date or date brown, sometimes spotted purplish chestnut, bay or cigar brown; surface unchanging when bruised. 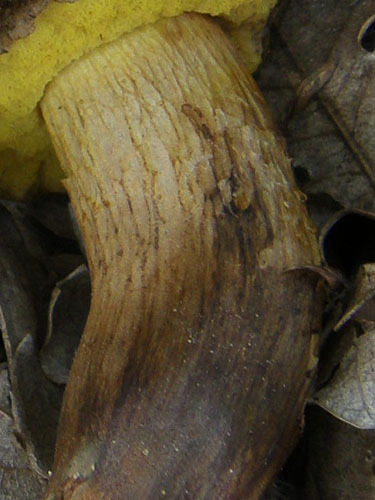 Stipe tapering or spindle-shaped, somewhat rooting, in the upper portion straw to buff coloured, downwards rusty, pale fulvous, snuff brown or cigar brown, sometimes almost black at the same base, slightly blueing after rough handling; stipe surface with a distinct reticulum and usually with a ring-like pattern of coarse granules in the upper portion, downwards finely granulate. Flesh pale lemon yellow in the stipe, whitish in the cap, vinaceous to vinaceous-brown in the stipe base, blueing when exposed to the air. 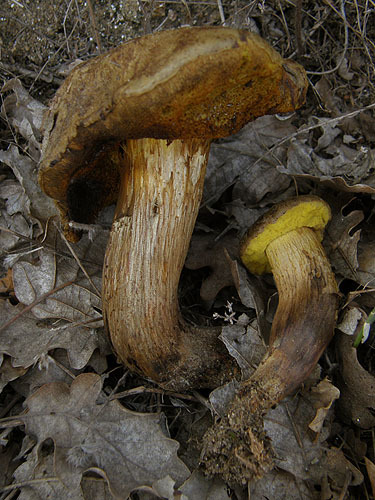 Tubes lemon yellow when young, then with somewhat olivaceous tint, blueing when injured. 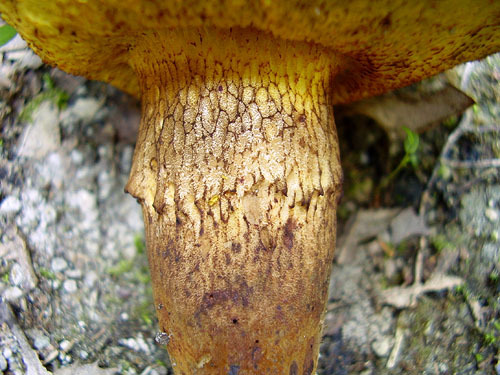 Pores angular, lemon yellow when young, later with olivaceous tint and often rusty spotted with age, blueing when bruised. Smell not distinctive. Taste distinctly acid. 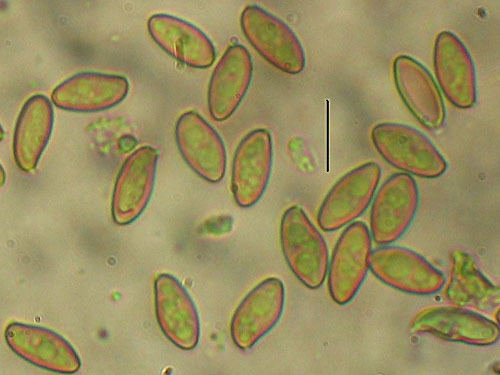 Spores 10–14.5 × 4.5–7 μm. Pileipellis (the cap cuticle) a trichoderm of interwoven branched septate thin-walled hyphae, terminal cells mostly cylindrical with rounded apex, 25–75 × 7.5–10 μm, ratio 3–10. Habitat. In warm broadleaf woodlands, mycorrhizal with oaks (Quercus). Distribution. Not yet fully understood, but as far as currently known, Xerocomus ichnusanus is a southern species. Records are known from Bulgaria, France, Greece, Italy and Spain. Alessio, C.L. 1984. 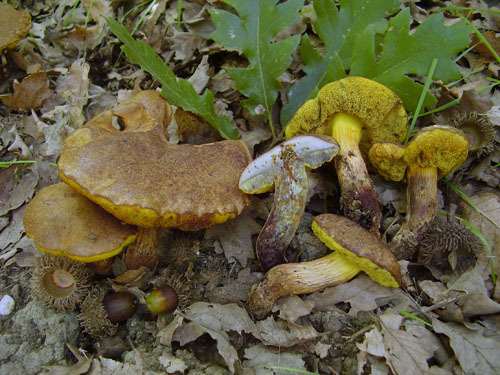 Un Boleto non ancora noto: Boletus ichnusanus Alessio, Galli & Littini. – Bolletino del Gruppo Micologico Bresadola 27: 166–170.